After a series of coordinated terror attacks in Paris, the Islamic State of Levant left the "city of light" in dark. Only hours later, world leaders began the G20 Summit in Antalya, Turkey. International media was quick to report that the terrorist attacks in France will dominate the G20 conference. Nevertheless, no military agenda should distract the G20 from its real job, which is that of supporting, accelerating and sustaining the kind of economic development that can undermine the underlying causes of terrorism. As the current G20 president, Turkey's President Recep Tayyip Erdoğan has pushed inclusiveness, implementation and investment for growth. In particular, the Antalya Summit hoped to push new measures on infrastructure investment, trade and structural reforms. What the world needs is growth and economic development. In this G20 quest, China will be the primary driver in 2016. G20 nations are the world's economic engines, which account for 90 percent of the world economy, 80 percent of global trade, 66 percent of world population and 84 percent of all fossil fuel emissions. Right before the G20 Summit, the International Monetary Fund (IMF) released a report about global economic growth prospects, which have been systematically marked down over the past half a decade. The IMF warned that there is a risk of a world economy persistently mired in sub-par growth, with high levels of poverty and unemployment. After half a decade of failed efforts to boost global growth, increasing unemployment, poverty and continued debt-taking, such an outcome would fuel increasing geopolitical friction. 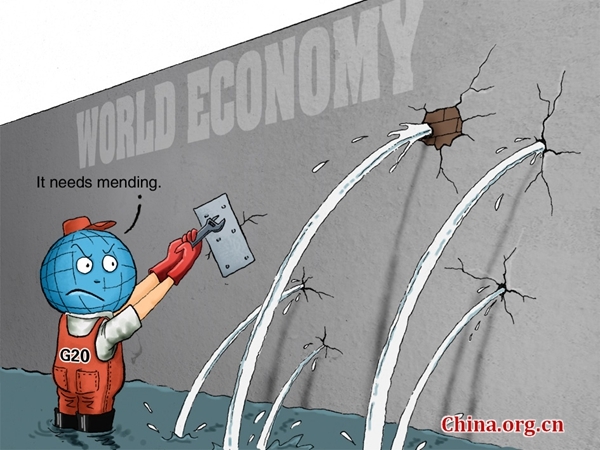 To secure a solid and sustainable recovery, G20 policies need a substantial upgrade that combined efforts to boost the cyclical rebound with structural reforms. Otherwise, the projected 3.6 percent growth in 2016 will have to be downgraded as well. However, international inter-governmental organizations are still dominated by the nations that won World War II - not by the economic powerhouses that will reign in the 21st century. In the official G20 paper, Turkish Prime Minister Ahmet Davutoglu noted that "the Great Recession in 2008-09 taught us that the solution to global challenges rests in global actions." So the challenge becomes, how can global challenges be mitigated when global organizations still represent mainly advanced economies - and thus their values and interests? In the absence of adequate and effective governance reforms, global economic and financial institutions - such as the IMF, the World Bank, the World Trade Organization, the Asian Development Bank and the rest - will not be able to handle unending crises. After the near-collapse of the global economic system in 2008-09, Washington, Brussels and Tokyo - the advanced economies that continue to dominate the IMF and other multilateral organizations - agreed to comprehensive reforms of global monetary and financial systems. And yet, even the initial, much humbler objectives - such as the 6 percent shift in quota share to the emerging economies - have been ignored by foot-dragging in the White House and the Congress. Similarly, the World Bank's capital increase did not materialize, even though emerging economies were ready to contribute. After half a decade of low growth, global organizations continue to represent the victors of World War II, not the economic powerhouses of the 21st century. But change is in the air.